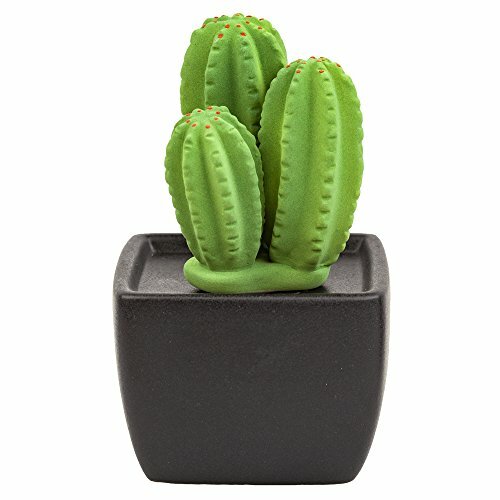 Uplift your mood, relieve stress and create a positive atmosphere for a wonderful time with family, simply or soothe your senses to fall asleep effortlessly with our attractive cactus shaped aroma diffuser - make the best use of your favorite essential oil, without destroying its properties with heat, which is the case with regular diffusers. ORDER NOW & Get this Cute & Functional Aroma Diffuser Delivered to you in Just 3-5 Days! ADORABLE FRAGRANCE DIFFUSER - A very unique, aesthetically pleasing & effective way to help transform your home or workspace into a more fragrant & inviting place with the goodness of your favorite essential oils - a wonderful way to alleviate stress & unwind after a tiring day. EXTREMELY SAFE - Designed to be safe even for babies, our ceramic aroma diffuser or ceramic oil diffuser does not require electricity, batteries, heat or burning - reliable as well as harmless compared to store-bought room sprays, electric diffusers or scented candles. EASY TO USE - You can either fill the essential oil diffuser with a combination of carrier oil like coconut oil and a little amount of your preferred aroma oil (up to 60 ml), or add a few drops of essential oil directly from the top - ideal for spreading aroma in an 8-12 SQM room. VERSATILE - Perfectly sized to fit work desk, bedside table, kitchen countertop, or even your car, you have 3 different cactus ceramic diffusers designs, a bird, owl & a hedgehog design to choose from - replace the old scents with healthier & refreshing fragrances that you adore! GUARANTEE - We also offer you 100% RISK-FREE SATISFACTION GUARANTEE on this aroma oil diffuser. However, you will love the cute yet functional aromatherapy oil diffuser that is easy to use, refill or clean, and which also proves to be a stunning gift for a loved one! If you have any questions about this product by Easy_company, contact us by completing and submitting the form below. If you are looking for a specif part number, please include it with your message.